Published on 5 February 2007. It’s a good while since I last posted about a film. In fact, the last I wrote on the subject was my seemingly scathing review of The Da Vinci Code in May last year. That is, at least in part, because I am terrible at writing film reviews. 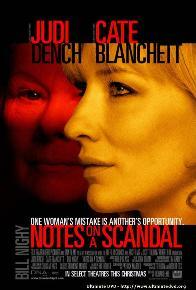 Over the weekend, though, I went to see Notes on a Scandal, and now feel compelled to post about it. It is an absolutely brilliant film. I know people say that too much, and you can find blogs anywhere that will say any film is brilliant, but this one is really, really good. And if you’re going to skip to the trailer, please don’t be put off – it’s a little lacklustre compared to the movie itself, and you’ll be glad to hear that the sound on the movie is actually in sync with the video, unlike on my dodgy copy of the trailer. In the film, Judi Dench perfectly protrays Barbara Covett, a near-retirement teacher who discovers an affair between the new, young and beautiful art teacher Sheba Heart (played by Cate Blanchett), and the film follows both as their worlds fall apart. It’s very hard to write about the film without spoiling it, and yet also convey how excellent it is. It comes very highly recommended. Just go and see it…! This 1,056th post was filed under: Reviews.